Cater to your loved one’s discerning tastes with a range of gifts that’ll make even the most ardent foodie’s mouth water. Give the cheese lover in your social circle hours of entertainment and access to more than 40 pounds of their beloved dairy product with this collection. 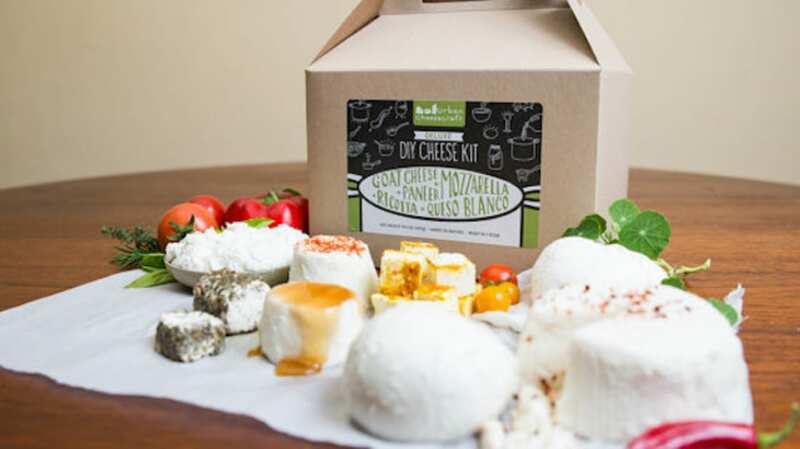 The starter kit includes instructions, materials, and molds to make at least 30 batches of mozzarella, ricotta, goat cheeses, paneer, or queso blanco—all in an hour or less. Even the most dedicated cooks can fall in a rut. Keep your favorite home chefs inspired with these dice from Two Tumbleweeds that dictate 186,000 possible meal combinations with die dedicated to protein, cooking methods, grains/carbs, herbs, bonus ingredients, and seasonal vegetables. Plenty of coffee connoisseurs have upgraded their morning cup of Joe to cold brew lately but you can’t just add ice to regular old coffee for the same effect. Each of these “bean bags” makes 36 cups of Grady’s famous cold brew right in the fridge. If you know your gift recipient’s favorite cravings—popcorn, pickles, bourbon, for example—you can get them a specialized Mouth monthly subscription. But if you want to keep your options open, or present them with variety, the Best of Mouth will send them the best offerings from independent food purveyors each month. For your favorite foodie who wants to be more conscientious about what he or she eats, this book tells the tale of an amateur chef who buys a whole cow and spends a year cooking nose-to-tail dinners and learning about the beef industry. Dessert aficionados know it doesn’t get much better than Momofuku Milk Bar. For devotees who live outside of New York City or Washington, D.C., the bakery does ship ready-to-eat sweet treats, but this mix will let the recipient whip up a batch of the famed cookies whenever they want. The rest of us are fine with store-bought goods but for the foodie who would rather churn themselves a custom ice cream creation worthy of their taste, this is the perfect gift. The single-serving sized bowl (available in six colors) makes hard or soft-serve ice cream in just minutes. A perfect mix of form, function, and variety, this handmade spice rack houses 22 glass vials of premium spices in a beautiful, engrave-able beechwood block. Housed in a hand-woven basket from Oaxaca, Mexico these global fair trade treats are the perfect gift for the foodie in your life who’s also full of wanderlust and goodwill. The company supports artisans around the world and monthly subscriptions are also available. Make your giftee's friends green with envy by sharing this spreadable matcha. The creamy jam is made with just four ingredients—straus cream top milk, match tea, salt, and sugar.